South Marston Primary School celebrated a remarkable landmark yesterday, reaching its 140th birthday. Celebrations have been going on all week to mark the occasion, including visits from ex-pupils who described what life was like as a schoolchild there in the past. Yesterday pupils and staff went to a special service at South Marston church before enjoying tea and cakes in the playground. The occasion was reminiscent of the celebrations held when the school first opened its doors on June 25, 1873. That day’s edition of the Adver described how its “magnificent building, which is of gothic style, with a lofty turret at one corner for the bell, was opened. A large party assembled and the splendid brass band of the 18th Wiltshire played on the lawn during luncheon”, the report said. The guests who have visited the school over the past week have explained to the children how the school has changed they have been given an opportunity to ask questions themselves. While much has changed in education over that period, some things are not too different. For one, there are currently 107 pupils – only slightly more than when the school started. 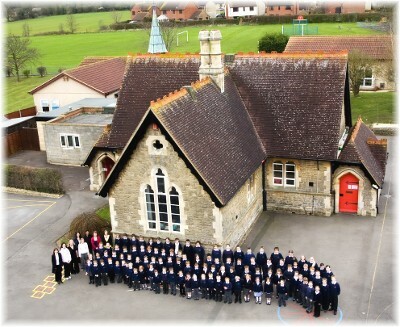 Still, current pupils will be thankful the building itself has seen plenty of modifications over the years, as the number of classrooms has now doubled to four, from its original two. Yesterday pupils and staff went to a special service at South Marston church before enjoying tea and cakes in the school playground. Locals have also been pitching in to celebrate the South Marston’s latest birthday. Loudest among them were the church-bell ringers, who rang a three-hour-peal in the school’s honour.